The Running Therapist. : Am I a minimalist? I have a topic today which I'm sure is bound to ruffle a few feathers. I am not claiming to be a self proclaimed know it all on the topic of shoes or how they effect different body types and running styles. But one thing I do know as a runner, is you have to make your choices very carefully. I'm totally obsessed with shoes of all kinds, but especially runners. As a child I can remember my Mother commenting on Dad's shoe collection. "How many pairs of running shoes do you need? You just bought a pair last week!" She'd say. I remember thinking the same thing. Now I totally get it. He bought a pair of distance trainers last week but this week was in need of some light weight track shoes! 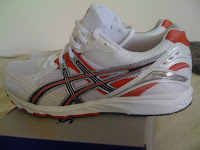 I am a runner that believes that for every type of running you need a different type of shoe. Manufacturers put in a lot of time and money to make sure that their products are giving the athletes every possible advantage by using them. So for the distance runner trying to go farther they put some more cushioning underfoot to make that easier. 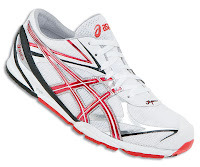 For the 100m sprinter trying to shave that 100th of a second off, they make the shoe lighter and more responsive. They've also pretty much thought of everything else in between. a connection and response from the road when I'm laced into my racing flats. Its almost better than my new spikes for the track. I am briefly going to touch on the other extreme of this shoe spectrum. My head is just spinning after researching so many different sources about this topic. It seems to be getting quite a lot of press recently and I guess that is why it sparked my interest. I've discussed the different types of Minimalist shoes and their benefits and potential hazards. Now I'll quickly discuss structured and cushioned shoes. 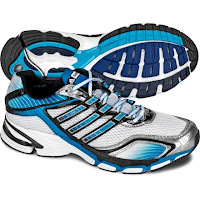 These shoes have been designed by shoe companies with the customers comfort in mind. Over the years shoe companies have experimented with all kinds of different materials and layouts for making their shoes more comfortable. They have used; foams of different densities, hexagonal patterns, shox, gels, Waves, padding and rubbers to displace our weight and make for a low impact experience. This is all fine and dandy and we appreciate the care that they've taken, but has all this come at a cost?? Recent studies have shown that severely padded shoes may actually hinder the body's natural ability to absorb shock and increase the risk of injuries to the knees and lower back. In any case, this whole topic could be disputed until I am blue in the face! Pro's of cushioned shoes; they are comfortable, help soften the longer distances are good for heavier runners and beginners. Cons; They force a heel strike or an un-natural foot strike, are heavier, less efficient. The truth of the whole matter is this and may it also be the conclusion of this blog entry, no matter what kind of running technique you currently have you must be completely conscious of the changes that need to take place when you are slimming down your shoe padding and changing your technique. There are different strengthening exercises which must be done before changing techniques to ensure an injury free transition. These changes must be done gradually. Listen to your body and research proper running techniques. I would be happy to consult with anyone one on one about proper running techniques and injury prevention for runners. If you are making the switch to minimalist shoes or even barefoot running consider the risks and benefits, and whether or not you even need explore this new trend before fully submersing yourself into the new culture. (or ancient culture considering where we all started off) As for myself, I am happy with the new speed found in my new forefoot running technique. I look forward to further refining it and balancing out the muscles in my legs for an injury free fall. I have noticed the my inner quads have become weaker than my outer ones due to an added bike workload. I must return to the gym to balance them out as to prevent any knee issues during my increased marathon training. Stay tuned for My Race report from the Squamish Days 10k. I haven't got time today as I'm racing 1500m at Swangard tonight, But will have it out by noon tomorrow. Thanks for reading. Those are great shoes, I think I can have one of those shoes for my coming long run.